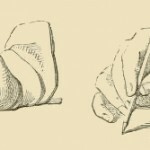 A collection of vintage drawings relating to the making of arts and crafts.For now, the copyright free images in this collection only display people painting. In the future, this collection will include vintage images of arts and crafts supplies and people making all sorts of things. Anyone looking for free vintage craft images or art images should be sure to stop here at Reusable Art where all of the images are copyright free and in the public domain. We also have a slowly growing collection of in the images of people section. 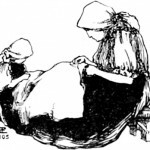 Charming drawing of mother and daughter sewing together. Dates back to a 1907 book on Hungarian folklore. 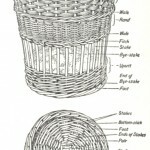 Who knew there were so many different terms used in basket making. I didn’t. You will though with this vintage public domain basket parts drawing. 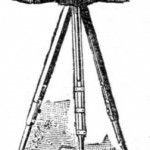 Vintage camera drawing from 1887. This advertising image of a camera with tripod brings back fun family memories of trying to capture those special moments. 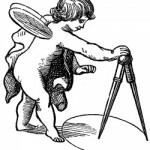 Vintage black and white drawing of Cupid drawing a circle. So many uses but Valentine’s Day and marriage certainly come to mind. 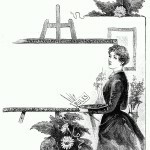 Lovely book illustration of a woman knitting. 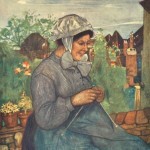 Landscape of Normandy surrounds her as she works on her knitting. Full color work by Nico Jungman (1872-1935). 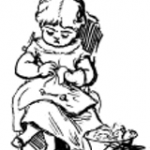 Vintage arts and crafts image featuring a cute little girl mending her dolly clothes. It is on the small side, but hopefully it will be just what you need. Sketch and study of a pair of hands drawing with pencils. 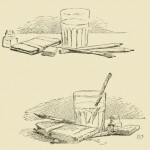 Pair of sketches of an artist’s tools. Drawing of an easel standing in the grass. 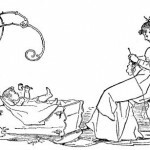 Charming drawing of a mother and child with the mother knitting. Drawing of an art teacher instructing on the rules of painting. 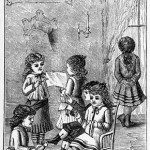 Drawing of a little girl sewing in the playroom.